Running Hot and Cold? Layer. 37°F at 7 am, 57°F by this afternoon and raining. What’s a man to do? Layer. The trick is to keep things from getting too bulky. Above you’ll see the cotton-cashmere sleeveless sweater given to me by Mrs. E. at Valentine’s. She was a bit worried about the colour. I’m not at all. 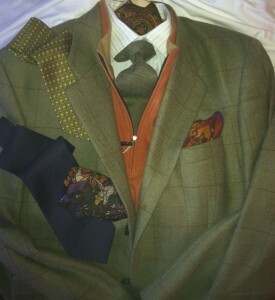 Click through and you’ll see three tie/square variations that work nicely, and I haven’t yet changed out the shirt. The whole kit and kaboodle could be worn with jeans, khakis, cords, whipcord or twill, or grey flannels. As the day warms up, the vest can come off or I could take off the tie and wear the vest, shirt and trousers as a casual ensemble. 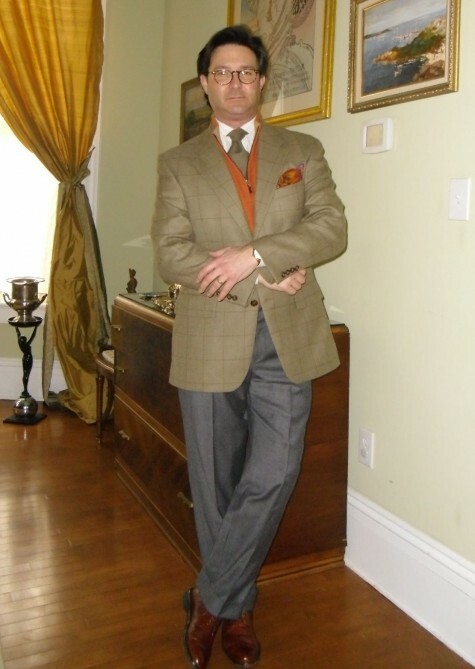 This entry was posted in Elegantology and tagged layering, Smart Casual, sweater vests. Bookmark the permalink. 3 Responses to Running Hot and Cold? Layer. Chris this sounds like Kansas City weather! I have been layering all season! Karena, what pieces do you choose? Around here, women don’t seem to layer much. The vest is definitely a keeper. Mrs. E done good.